dynamic designs in the same price range." measures 2"W x 48"L and crosses over to the 442-square-inch planar-magnetic midrange/bass panel at 600Hz." 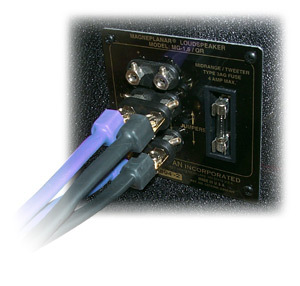 Use "Of interest for picking a partnering amp is the MG1.6/QR's low sensitivity, 86dB/2.8V/m, and 4-ohm load"; adapters are required for use with spade-terminated speaker cables. Value "Can more than satisfy audiophiles and music lovers, and you will not outgrow them as either the years or equipment upgrades pass by." Quick -- can you name a great $1700 loudspeaker? Anything come to mind? This question will eliminate most, if not all, of the floorstanding competition. So what are we left with? Looks like were down to minimonitors and the Magnepan MG1.6/QR. Magnepan has seemingly been around since the dawn of high-end time. Actually, Jim Winey founded Magnepan in 1969. Still, from the viewpoint of the high end, thats almost the beginning. For over 30 years, Winey's been designing, refining and redesigning his planar-magnetic speakers. Today, his revolutionary idea for the loudspeaker has reached maturity, with Magnepan offering a large product lineup for two-channel and home-theater/multichannel applications. Construction is the area most unique to Magnepan. When Magneplanars were first introduced, it seemed impossible for a speaker only an inch and a half deep to produce top-quality sound. But Winey managed to pull it off. To handle the midrange and low frequencies, he used a large piece of Mylar with thin strips of aluminum bonded to it and stretched between magnets instead of a cone. Then he used a long, vertical ribbon of aluminum, again suspended between magnets, in the place of a dome tweeter. These ideas were and still are real innovations. The $1675-USD-per-pair MG1.6/QR is a visually imposing speaker that measures 64 1/2" high by 19 1/4" wide but a mere 2" deep. Each speaker weighs 40 pounds and stays upright via a pair of metal supports that screw into the panel near the bottom. The MG1.6/QR's quasi-ribbon tweeter, from which the QR in the speaker's model comes, measures 2"W x 48"L and crosses over to the 442-square-inch planar-magnetic midrange/bass panel at 600Hz. The crossover is a 12dB-per-octave design for the tweeter and 6dB-per-octave design for the midrange/woofer. Quoted frequency response is 40Hz-22kHz +/- 3dB. Of interest for picking a partnering amp is the MG1.6/QR's low sensitivity, 86dB/2.8V/m, and 4-ohm load. Magnepan recommends at least 50 watts, and those should be delivered by an amp that can handle 4 ohms. One note about speaker cables. If your chosen cables have spade connectors on the speaker end, you'll need special adapters that Magnepan sells separately ($17 for nickel-plated adapters, $22 for gold-plated ones) in order to use the MG1.6/QRs. The speakers are biampable/biwireable. The MG1.6/QRs are dipole speakers, which means they radiate sound from the front in phase and the back out of phase. Therefore, setup can be an arduous process -- and for reasons other than sound. They are more difficult than most box speakers to integrate into modern décors, although the ability to dress them up with various colors of grille cloth and trim strips makes things a little easier. And while its true that you can place a pair of Maggies almost anywhere and still get sound (the picture on the Magnepan website of the MG3.6/Rs on either side of a sofa and up against the wall just kills me), you wont get all the sound youve paid for without some heavy experimentation. Youre going to have to spend time rearranging your listening room, positioning and re-positioning the MG1.6/QRs again and again until you find the spot that allows them to sing to their greatest abilities. That spot, when finally found, will most likely be well away from both the front and side walls and out into the room -- not a recipe for domestic acceptance. In comparison, smaller stand-mounted minimonitors are much easier to blend into a room. For me, it took two full rearrangements of my 13' x 15 1/2' x 7' living room before I discovered the sweet spot for the MG1.6/QRs. I first tried positioning them along the long wall. While this setup allowed the speakers to be over three feet out from the front wall, well separated, and well away from the side walls, it put me in a back-against-the-wall listening position, which wasnt good for imaging. So the alternative was to rearrange everything for a short-wall setup. In this position, the speakers, are four feet out into the room and over three feet from the side walls, slightly toed-in. This allows me to put my listening seat three feet from the wall behind me, with the associated imaging benefits. While this setup works much better for my listening pleasure, my long-suffering wife, by now totally resigned to my audio addiction, would probably disagree as to the living room's aesthetic qualities. I will tell you up front that since my first audition of the MG1.6/QRs Ive become a planar admirer. There is something about the manner in which a planar speaker loads my room that sounds more like live music to me than Ive ever heard from dynamic designs in the same price range. The seamlessness of the sound, the total lack of boxy colorations, and the more true-to-life-sized images projected by the MG1.6/QRs are wondrous to behold (beheard?). In this regard, my old PSB Stratus Minis, a very good pair of minimonitors, tended to beam pint-sized images out into the room. Loudspeakers  PSB Stratus Mini. Preamplifiers  Audio Research SP6A and SP16. Analog  VPI HW19 Mk IV turntable w/ Super Arm Board and VPI VTA adjuster, Butternut Audio-modified Rega RB300 tonearm, Clearaudio Aurum Beta S and Sumiko Blue Point Special cartridges. I decided to begin my examination of the MG1.6/QRs with the lower frequencies -- I like good bass -- and work my way upward. Andy McClouds CD Blues for Bighead [Mapleshade 07832] gave me a solid indication of the strengths and weaknesses of the bass of the MG1.6/QRs. McClouds acoustic bass was nicely detailed, with a good sense of its size and a genuinely woody sound. There was no rumbling quality there, just a tight, taut and detailed portrayal. It was easy to hear McClouds fingers as they plucked the strings. The sense of an upright bass being played in real space was better served by the MG1.6/QRs than with any box speaker Ive had in my house. The realistic weight of an upright bass was the only missing element. The Mosaic vinyl boxed set The Complete Columbia Recordings of Miles Davis and John Coltrane [Mosaic MQ9-191] gave another demonstration of the low-frequency qualities of the Maggies. Paul Chambers' bass was clearly rendered no matter what the recording circumstances. The difference between the recording venues was laid bare before me. Again, the only thing lacking was the full weight of the instrument, which is something large cones capture better. But what surprised me was the fact that both the bass quantity (while still lacking the deepest reaches) and quality seemed to improve via the Maggies over that of the Stratus Minis, which for minimonitors are no slouches in that regard. Over time, Ive found I can live with the sacrifice of the extreme bottom octave provided that the bass Im hearing is of good quality, as it is with the MG1.6/QRs. Moving up the sonic ladder, I came to the midrange, always one of Magneplanar speakers' strengths. Ive been on a John Prine kick lately, and the MG1.6/QRs easily differentiated between Prines vocals from his early years, when his voice had a youthful though cigarette-stained vigor, through todays more mature and ravaged sound. On one of his latest releases, In Spite of Ourselves [Oh Boy Records OBR-019], Prine is singing duets with a number of female country divas: Emmy Lou Harris, Iris Dement, Lucinda Williams, Melba Montgomery, Patty Loveless, Trisha Yearwood, Delores Keane, Connie Smith, and his wife Fiona. The MG1.6/QRs easily sailed through all these contrasting female voices, allowing me to hear the uniqueness in each as they harmonized with Prine. In this regard, the MG1.6/QRs did a much better job than any smaller minimonitor I've heard. Both the image size and that effortless quality of musical reproduction came through on the MG1.6/QRs. Heading back to Upper Marlboro, Maryland (home of Mapleshade Records), I slipped John Cocuzzis Swingin and Burnin [Wildchild 06652] into the CD player. Man, did Cucozzis vibes shimmer and shine! I could almost see him behind his instrument, mallets in hand, and hear each and every note tail off into, well, almost eternity. And Allan Vaches clarinet seemed to soar in from out of nowhere, its reedy essence conveyed clearly by the Maggies. The treble of the MG1.6/QRs, while realistic, is a tad subdued. It doesn't offer ultimate air and extension. This isnt surprising given that the MG1.6/QRs lack Magnepans true ribbon tweeter, relying instead on the company's quasi-ribbon to handle the top end. Still, at the price of the MG1.6/QRs, you wont find sweeter, more neutral, more extended and seamless treble coming from any speaker. The dome tweeter of the PSB speakers may have extended further and was a tad more crisp, but these came at the expense of the naturalness and cohesiveness of the Maggies quasi-ribbon. A recording that shows off these traits is Duke Ellingtons Jazz Party In Stereo [Columbia LP CS 8127]. On the opening track, Ellington uses a slew of percussion instruments -- vibraphone, xylophone, glockenspiel, marimba, assorted kettledrums, bongos, tambourine, and triangle. It was easy to sort out the differing sounds and overtones produced by this diverse percussive lineup over the MG1.6/QRs. Still, there is a subtle but definite lack of air; the highs didnt seem to trail off into the surrounding acoustic space as well as they do with Magnepans true ribbon tweeter or a very good soft-dome tweeter such as the one used in the PSB speakers (or, for that matter, in real life). One of the strong points of any Magneplanar speaker is its coherence: the seamless quality that causes all the frequencies to blend together as a whole sonic piece, not two or three separate sections joined together at crossover points. Minimonitors tend to get much of this coherency right due to their small size and single crossover point; they just do it in miniature. This is most notable on solo-piano recordings. To test this, I used some of the Pro Piano discs I reviewed here not long ago. I was amazed to hear that there were no parts of the piano sound that seemed to be brought forward. Each note fell into the same sonic line as its predecessor whenever the pianist ran up and down the keyboard. And I was listening to a full-sized instrument, not the one-third-sized piano I had gotten used to hearing from the PSBs. This is a neat trick and one that went a long way toward making me believe that I was listening to a live recital instead of a reproduction. The greatest consideration with the MG1.6/QRs is their looks. Yeah, looks. I know -- appearances are not supposed to matter to audiophiles. But having a tall, wide flat-panel speaker dominating your living room tends to rank well down on the spousal-acceptance scale. Lord knows the MG1.6/QRs arent my wifes favorites. She greatly preferred the looks and size of the PSB Stratus Minis, sonics not being her top consideration. So if size and aesthetics are priorities, you should look elsewhere. Another consideration is placement. As I mentioned, youre going to have to really work with the Maggies to find the spot in which they sound their best. And then youll have to arrange your living space around them if that's where your system is housed. Youre going to need a decent-sized room (bigger is definitely better where the MG1.6/QRs are concerned) to get the speakers to sound their best. You'll find greater domestic acceptance with a good minimonitor, and have an easier time placing it too. One point in the Maggies' favor is that they are light enough to slide back against the wall when youre entertaining, then slip them back out for listening. Just remember to mark your spots before you move them or youll be back playing the positioning game all over again. A major consideration is power. Youll need a lot of it to make the MG1.6/QRs stand up and sing properly. If you want realistic sound levels, then that wimpy little British integrated just isnt going to cut it (and you can forget even thinking about going SET). Magnepan recommends a minimum of 50Wpc, and I would urge you to double that. So if your budget doesnt extend far enough for a good and powerful amp (and youll want the best you can afford with speakers as revealing as the MG1.6/QRs), then you may want to look more closely at those minimonitors sitting against your dealers wall. The final consideration is in regard to bass output. Yes, the MG1.6/QRs do go deep enough to negate the obvious need for a subwoofer that many minimonitors in their price range require to sound convincing. But the MG1.6/QRs' bass will not cause either you or your room to shake. While the bass thats there is well defined and detailed, its never going to go deep enough to satisfy metal heads, Mahlerites, or organ enthusiasts, but then neither will that of minimonitors. Should you feel the need, you could overcome this by adding a good sub. But such a solution comes with a substantial cost upgrade, thereby undercutting one of the major pluses of the MG1.6/QRs: their price. The Magnepan MG1.6/QRs are great speakers and one of the best values in the world of high-end audio. They take sonic performance well past the domain of most similarly priced minimonitors and well into full-range-speaker territory, but without the additional cost. The MG1.6/QRs' list of strengths, few compromises, and relatively low cost for the quality of sound offered are hard to match. And while you may not be equal to the full investment required for owning a pair MG1.6/QRs -- namely, the sacrifices youll make to décor, room arrangement, domestic tranquility and the cost of the associated power amplification -- if you make the effort, you will be rewarded. The MG1.6/QRs are speakers that can more than satisfy audiophiles and music lovers, and you will not outgrow them as either the years or equipment upgrades pass by. They are ready-made classics. Price: $1675 USD per pair.